Not to worry. If you were physically fit in the past, but have recently let yourself go, you can do the program as long as you start out easy and slowly build your strength and endurance back up. Even though MAX Workouts is a high-intensity program, the workouts are completely scalable to your current fitness level and in the book, I explain how you can decrease (or increase) the intensity level of each workout so you can progress at a pace that’s right for you. If you are really really out of shape , you can even start by performing the Dynamic Warm-Ups in the book prior to beginning Level 1 of the 90-day program. Do these Dynamic Warm-Ups on Monday, Wednesday and Friday for the first week. This is a great way to get your body moving functionally and used to working out again. 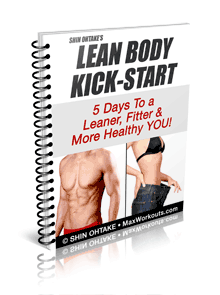 The next week, try doing Interval Cardio Workout AA (in the book) on Tuesday and Thursday. Ignore the “Effort Level” for this workout and instead start out with a lower intensity activity (e.g. an easy jog or fast walking). Be sure you give yourself time to read over the program, look around the website and try out some of the exercises. This is a great time for you to practice the movements and get familiar with the exercises. After the end of two weeks, you should be ready to officially start the program. Just make sure that you start off by doing the workouts at a moderate intensity so you don’t suffer from too much soreness. In the book, I explain how to decrease and increase your intensity level so you can progress at a pace that’s right for you. If you’ve never been active or exercised at all and have generally lead a sedentary lifestyle, MAX Workouts will be too intense for you at this point in time. I recommend that you start with a lower intensity program before beginning MAX Workouts.